Not for the first time, Harley-Davidson shares are struggling after poor business results by the company. The current struggle for HOG shares follows the announcement of a lower than expected profit for the last quarter of 2018. This adjusted profit was $0.17 per share, against an expectation of $0.28 per share. The US retail sales for Harley-Davidson (bikes and related products) fell by 10.1% for the quarter. This is a worrying sign for the company as US sales make up half of total sales. One of the biggest struggles that Harley has is to replace it’s ageing customer base with a new, younger demographic. The problem is that the ‘cool’ factor the company once had, does not seem to have reached the millennial generation. Work has been done to change this, but results have not shown any improvement so far. The company has also made an effort to increase sales by selling more products overseas. Unfortunately for Harley, it is also yet to reap any rewards from these efforts. Sales in foreign markets fell by 2.6% in the quarter, when compared with the same period in 2017. This situation does not seem set to improve any me soon. The expected number of overseas shipments from the company this year is around 222,000. This is the lowest number of shipments it has made outside of the US in eight years. Harley’s latest venture aimed at improving sales has recently been in the news. The full production version of the LiveWire electric bike has been unveiled. The aim of this model is to attract the attention of the growing number of riders opting for the environmentally friendly option of electric when buying a new machine. The major issue with the LiveWire is its price. At a retail cost of $29,799, it’s way above the $10,000 average for an electric bike. In the current financial climate, even fans of the brand may find themselves being priced out of the market. It’s perhaps understandable that Harley is looking to retain its luxury brand image with it’s pricing. However, if the pricing strategy sends potential customers elsewhere, because they cannot afford the product, this is unlikely to help the long-term future of the brand. 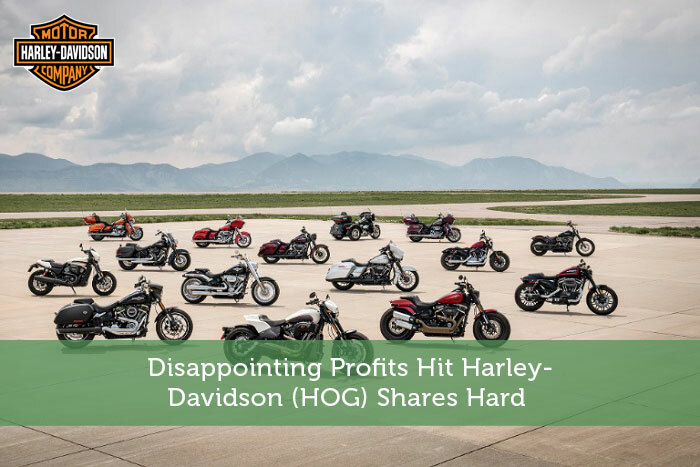 The current situation with HOG shares has to be concerning for the company, especially considering the negative effect that President Trump’s backing of a potential boycott is having. The potential boycott was suggested following Harley’s decision to move some of its production to Europe; a decision that did not go down well with the President. 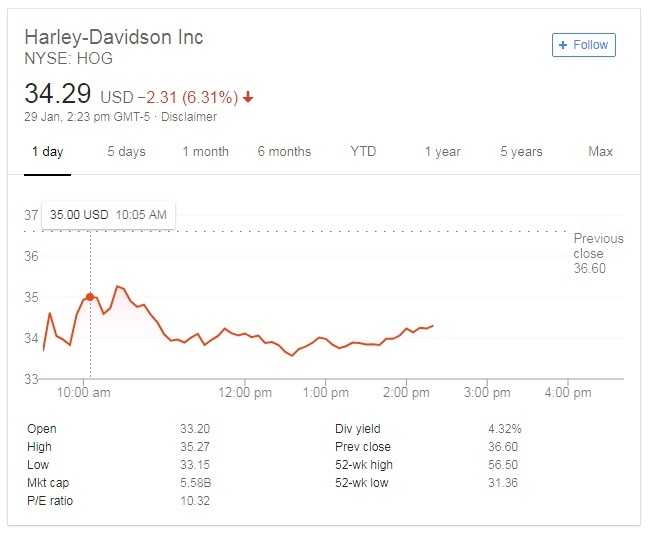 It remains to be seen what the future holds for Harley Davidson, but it’s shares have fallen a significant 30% since the start of 2018. It’s going to be a hard fight to overcome potential boycotts, bring back the cool factor and make people want to invest in Harley Davidson machines again.